An assortment of glues and cements, on the tying bench, are as important to the warmwater fly tier as any other tool or material found there. Here is what you will find on my bench. When I discover new products in this catagory you can bet I will post them here. There are a number of glues and cements that I find indespensible in my fly tying activities. Zap-A-Gap is one of them. 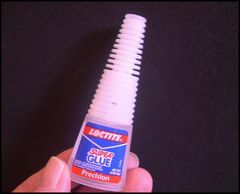 During the tying process, I often use this glue to make a Zap-A-Gap knot. Simply coat an inch or so of the thread, nearest the hook, with the glue and wrap the wet thread on top of the existing wraps, The Zap-A-Gap knot is just as good as a whip finish. Zap-A-Gap is water resistant. Very important to fly tiers. I have used it for many years and it has never failed me. Zap-A-Gap dries almost instantly. Keep the cap on it at all times. Replace the cap immediately after using it. Don't get glue on your fingers because you will instantly glue them together. Another glue that I can't do without is an adhesive called Goop. Actually, it goes by a number of names; Household Goop, Shoe Goop, Automotive Goop, and Sportsman's Goop. It all depends on which department you are in at your favorite hardware store or home center. 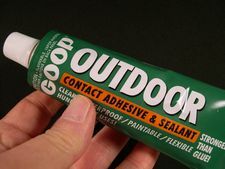 Goop is tauted as a contact adhesive and sealant. It certainly is that. You shouldn't glue eyes to a deer hair head or body without using Goop. It's simply that good. It also works best for glueing eyes on wool heads. Dave Whitlock says that the a deer hair bug will fall apart before the eyes fall out if the eyes are glued into eye sockets with Goop. I agree. In one respect, Goop is like Zap-A-Gap. If you don't replace the lid immediately, you will be sorry. Put it down on your bench without the cap and see what happens. Goop everywhere! 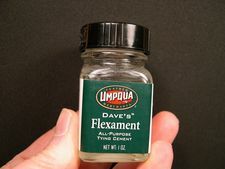 Another glue that I must have on my tying bench is Dave's Flexament. I use it to coat thread wraps, paint the faces of hair bugs before trimming them, and sealing reverse tied deer hair heads on Hairabou Streamers or Sliders. I also use it to prepare feather slips for wing cases on nymphs. But, it's most important use is creating a membrane in deer hair bugs to accomodate rubber legs that are sewn through the membrane with a Whitlock Leg Sewing Tool. 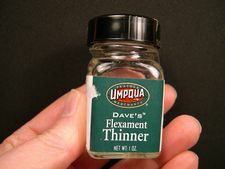 For Dave's Flexament to accomplish the tasks mentioned, as well as other tasks, it needs to be thinned with Dave's Flexament Thinner. The Flexament should be thinned almost to the consistency of water for it to work best. 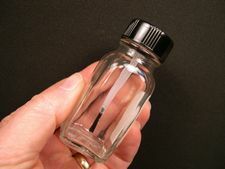 I thin Flexament by mixing the glue with the thinner in a seperate bottle which has an applicator useful in applying the adhesive to fly tying materials. The bottle is made by Griffin Enterprises. What makes it really unique is that it has a brush similar to a fingernail polish brush attached to the lid. It really makes applying flexament, in every tying situation, very easy. I couldn't get along without Griffin Applicator Bottles. If you can't find a Griffin Applicator Bottle at your local fly shop or at a mail-order house, you have two options. You can make your own by buying a bottle of nail polish, dumping it's contents, and cleaning it with turpentine. Or, you can go online and order one from Griffin Enterprises. 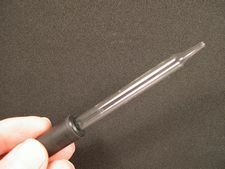 To thin Flexament, I fill the Griffin Applicator Bottle about half full. I then begin to add small amounts of Thinner, with an eye dropper, until the Flexament reaches the right consistency. As Dave Whitlock says, "about the consistency of water." As with any adhesive or thinner, be sure to put the caps back on the bottle immediately after using the product. Also, make sure that the cap is as tight as possible to prevent evaporation. 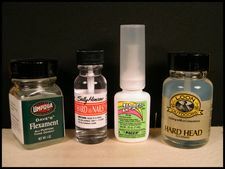 Every fly tying bench needs a bottle of head cement. It's hard to decide which is best. There are dozens of head cements on the market. So, let me help you decide which head cement is the best one. 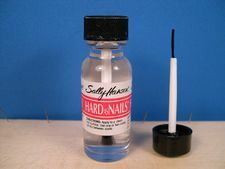 Hands down, I think Sally Hansen's "Hard As Nails" clear nail polish is the best head cement around, and there are plenty of fly tiers who agree with me. You can find it in the cosmetic section of almost any drug store. You do need to reduce the size of the "Hard As Nails" brush so you can paint heads on the smallest flies. The photo attempts to show a brush that has been reduced about 80 per-cent. The easiest way to reduce the size of the brush is to clean it thoroughly with paint thinner or turpentine. Let it dry. Cut away the appropriate amount of bristles with a small very sharp scissors or razor blade. 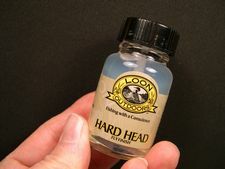 Loon Hard Head Fly Finish is an outstanding material. In many instances it can replace messy epoxy. It's also a great head cement. It's water based, making it the most environmentally friendly adhesive on my bench. In fact, you can thin it with plain old tap water. Loon Outdoors states that you can build up large glossy heads and bodies with it. They suggest using it as an epoxy replacement. I agree! I use it to give a hard outer shell to flies like the Skipping Minnow, Zook's Pencil Popper, and The Rabbit Strip Minnow. Hard Head also works well for sealing the heads on Hairybou Streamers and Sliders. We now have a product on the market, that really works for binding two rabbit (Zonker) strips together, to make flies like the Double Bunny and Rabbit Strip Minnows. In the past, we used gel type super glues to glue two strips of hide together. The outcome was a fly that was stiff and inflexable. Not any more! Tear Mender was designed as a fabric and leather repair adhesive. It's non-toxic, dries in three minutes, applies easy and fast, stays flexible, and it's waterproof and permanent. It's manufactured by Val-A Chicago, Inc. It's available through many fly tying outlets including Feather-Craft Fly Fishing in St. Louis, Missouri. I haven't checked, but it's probably available at fabric and/or craft stores as well. 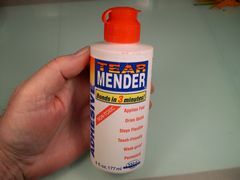 The best way to apply Tear Mender is to put a gob of it on a sheet of paper. Then, use a toothpick to apply a thin line of glue on the hide side of the rabbit strips that you're glueing together. 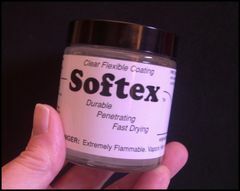 Softex is a clear flexible coating that can be used on the bodies or heads of a number of fly patterns. It's durable, penetrating, and fast drying. Softerx is often used in place of hard-curing, prone-to-chip or break, epoxy. Softex creates a soft, flexible, and surprisingly durable head or body on both saltwater and freshwater flies. You can brush or dab it on a fly or dip the item into the jar to coat it and then slowly withdraw it from the jar. It's a good idea to use a drying wheel to assist in the drying process which takes about four hours. I have been using Zap-A-Gap as the super glue of choice on my tying bench and it's good stuff. The one problem that I have encountered is that, even with the cap used properly, it dries up in the bottle over time. You also are required to use and extender nozzle with it that has to be removed after it's used. Some time ago I purchased a bottle of Loctite Glue at my local Ace Hardware Store and I have found it to be every bit as good as Zap-A-Gap. Loctite has several features going for it. First, it has the extender nozzle built in. Secondly, because of its unique cap, it doesn't dry out. 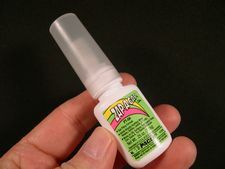 Finally, it's cheaper than Zap-A-Gap and I believe that the bottle contains more glue. Here is the latest addition to my fly tying bench, and it's a good one. 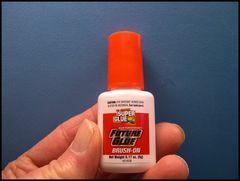 It's Super Glue in a bottle with a brush in the lid just like you find in a nail polish bottle. Often, during the process of tying a fly, I use super glue to make what I call a Super-Glue knot. I use it to lock materials in place and I frequently use it instead of a whip finish or half-hitches to tie off the head of the fly. To make a Super Glue knot, you simply wet the thread nearest the hook and take a couple of turns of wet thread on the previous thread wrap. The glue dries almost instantly and you have your knot. The brush helps you control the amount of glue that you apply to the thread and that's a big help. In the past, using Zap-A-Gap, I would get the thread wetter than necessary. The Brush-On Super Glue application eliminates that problem. The bottle of Super-Glue in the photo was purchased at my local Wal-Mart store. Go to your store and buy a bottle. I'll bet it will become the only Super-Glue you use.